Full service carrier Vistara – a JV of Tata Group & Singapore airlines, which is battling low Load Factors since it started flying in January, has announced its next phase of expansion. The airline will start services to Lucknow and Bengaluru effective 18th May and 16th June 2015 respectively. With this addition, the airline will fly to 10 destinations with a fleet of 6 aircraft. The airline will connect Lucknow to its hub New Delhi, initially with one daily flight and effective 16th June 2015 will add second daily flight while Bengaluru will be connected to Delhi and Mumbai with one daily flight each. The airline has stopped reservation on its second daily Mumbai – Ahmedabad flight. I believe that the flight would be re-timed of the vacant slot could be used to launch services on the Mumbai – Goa – Mumbai sector. However, the additional two flights will only make it come close to 50% ASKMS (Available Seat KiloMeters) on Category 3 routes and not cross it. So I will wait how the airline responds to cross that mark. The airline will face tough competition from IndiGo on Delhi – Lucknow sector with its 7 daily flights (1260 seats each way), followed by Jet Airways with its 5 daily flights. Air India and Go Air are the other operators on this sector. On the Delhi – Bengaluru sector, Full service carrier Jet Airways & market leader IndiGo hav 10 frequencies each. 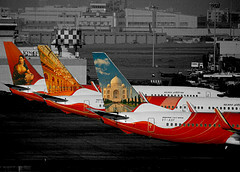 This sector also sees B787 flights from Air India and will see some fare wars as Air Asia has announced flights too. With this expansion, the airline which currently has 6 aircraft in fleet will utilize all its aircraft fully for the services and have 237 weekly departures deploying a total of 35076 seats per week in the Indian market, which translates into an average of 5011 seats each day. The calculation is with effect 16th June since till then Vistara along with others have temporarily changed flight timings to Goa, owing to the runway work at Goa, which has impacted other flights in the network. The airline has focused its expansion primarily from New Delhi, and potential connections like Mumbai – Lucknow, Mumbai – Goa and Mumbai – Hyderabad have not been part of this round of expansion. The seventh aircraft is not expected immediately. Thank you for yet another interesting piece of analysis, Sir! Vistara do not seem to have had a smooth start on their ops, with low load factors, incommensurate pricing, and a watchful expansion. While one cannot predict the future, given that this is a JV of two very strong partners, I am sure they would be analysing the results and coming up with suitable course-correction strategies, as needed. The watch on the route dispersal guidelines was nice. Their hubbing at DEL makes perfect sense. LKO/GOI is a comparatively safer market for domestic ops. BLR is a different kettle of fish, where many airlines have suffered. The AMD one is a bit difficult to understand from my armchair. Ameya Sir: the one part I think most of us would like to see in your analysis is some suggestions, in addition to the analysis. Your suggestions would have great value, since you follow situations very well. Suggestions on long-term planning with the 3-class cabins (especially Y+), suggestions on the RDG Cat 3, suggestions on improving aircraft utilisation vis-a-vis keeping some slack in the schedules, and avoiding rapid expansion vis-a-vis consolidation, etc. Thank you!